Please join us on May 9th from noon to 1 p.m. in the Level 2 Reading room for an author talk with Margaret Casteline Bowen, co-author of Jersey Gold: The Newark Overland Company’s Trek to California, 1849. Margaret Casterline Bowen began this research that eventually became this book as she looked into the genealogy on the Casterline side of her family. Because of the research and what was found you will hear about the New Jersey pioneers who traveled overland to California in search of gold. This fascinating story will tell of this group’s search for fortune from the Oregon- California Trail to Independence, Missouri, which at times turned into heartbreak. These Jersey men were driven by money, touched by personal scandal and tragedy, and associated with progressive women. Follow the lives of the significant participants as they become wrapped in the spectrum of events that shaped the nineteenth century from the chaos of the Civil War to the throes of the Industrial Revolution. All are welcome to this free program. An RSVP is appreciated. Please respond to Cindy Warrick at 609-278-2640 ext. 172 or cwarrick@njstatelib.org. 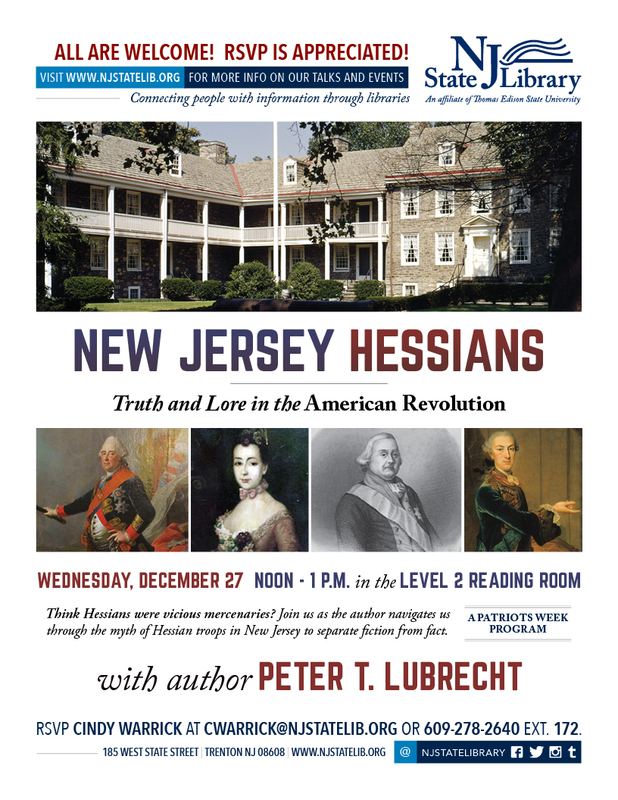 Please join us on December 27 from noon – 1 p.m. for an author talk with Peter Lubrecht titled, New Jersey Hessians – Truth and Lore in the American Revolution. During the American Revolution, five thousand of the thirty thousand German troops hired by Great Britain to fight rebellious colonists marched across New Jersey. Though popular legend would cast these individuals called Hessians as cold and vicious mercenaries, many were prisoners of war with little choice. Stories of their exploits still circulate in New Jersey. 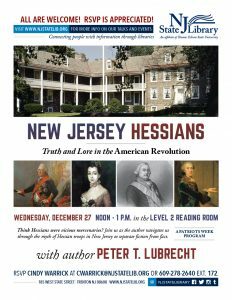 Join author Peter Lubrecht as he navigates the myth of Hessian troops in New Jersey to separate fiction from fact. NOTE: This program is part of Patriot’s Week held in downtown Trenton and the surrounding area. Many individuals attended last year’s program at the State Library. The room has a capacity of 75, please try to RSVP for this event. You can RSVP to cwarrick@njstatelib.org or 609-278-2640 ext. 172.